Few sports video games are truly timeless. Even the best—MVP Baseball 2005, NFL 2K5—show their age and shortcomings immediately, and more than their contemporaries in other genres. It's the special burden of sports titles, tasked with reflecting both the state of the art and the state of reality inside a one-year snapshot. But eight years ago, if you popped in Madden NFL 2005 for the Xbox and Madden NFL 06 for the spanking new Xbox 360, there was little question which version was out of place. Madden 06 may have looked prettier, but significant features—right down to the play-by-play announcers—were wholly absent from the game's high-definition debut. Other series took years to regain feature parity with their predecessors. Some franchises lost a fatal amount of momentum and relevance, like NHL 2K and NBA Live. It'll go down in history as a humbling era for the genre, which is why the advent of the PlayStation 4 and Xbox One raises more skepticism than excitement in longtime sports gamers at this hour. Only EA Sports' NHL and 2K Sports' NBA 2K series bridged both console generations with reputations largely unsmudged—though their direct competitors both suffered setbacks in quality, and their first offerings on new hardware were hardly mindblowing. "As a company, we were kind of overconfident in our position, and I lived through that transition at that time," said Andrew Wilson, the current EA Sports boss who, before, was the executive producer of FIFA and later the label's chief of development. "We had an internal engine that was going to be our core engine; that didn't come together," Wilson said. 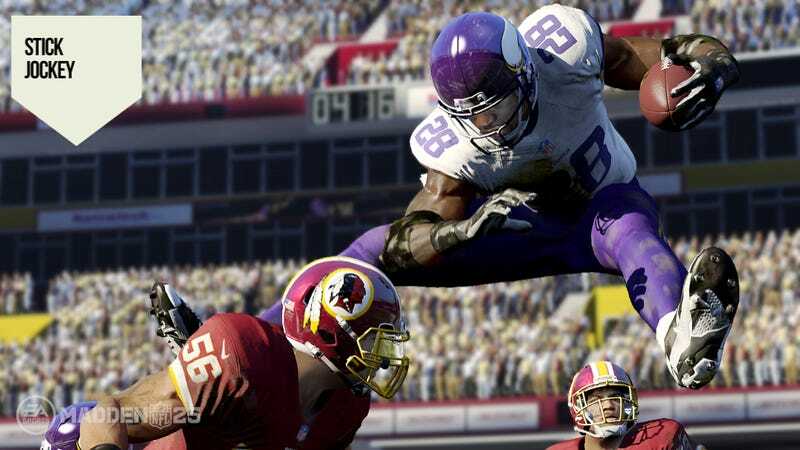 EA Sports tried to acquire another engine. "And that did not go well," he said. "We were adamant that we would never put ourselves in that position again," Wilson said. "Our last transition at this time, we did not have a game that was playable, and Madden was in a terrible state. Today, we've had these really early wins, and we believe there's going to be a multiplier effect happening from that collective effort." For EA Sports, the lessons learned manifest themselves in something called the Ignite Engine, which has a nice logo and a nice name but, to gamers so far, a vague application to the four titles it's associated with—Madden, FIFA, NBA Live, and an upcoming UFC title. Candidly, it sounds less like a piece of proprietary technology—like Unreal, Euphoria or Frostbite—and more like a set of sensible business practices. When I asked Wilson what was so special about Ignite, he didn't ramble off a bunch of engineering jargon that neither of us would have understood anyway. Basically, Ignite draws on the work everyone already is doing and unifies it under something all parties can use. That's not the sexiest marketing proposition, but the collaboration means that "The work we're doing today is now on a feature level, rather than at a lower level of development," Wilson said. In short, things are further along in June 2013 for these titles than they were in June 2005. FIFA, widely seen as the world-beater among sports titles, was in a lot poorer shape during the last console transition, when that team was working alone. Thanks to Ignite, "We have FIFA running at 60 frames per second, playable, today, on generation-four consoles" said Matt Bilbey, the general manager of football. "At the last transition we weren't at that level until a month before launch. Madden was in the same crunch eight years ago. "That was a case of an attempt to completely rewrite a bunch of technology that didn't turn out too well," said Cam Weber, EA Sports' general manager for American football. "We're starting the transition at the end of this console generation, not only with a more solid set of technology, but if you look back a year ago, we were already rewriting game modes, developing core gameplay built on runtime physics. Those are systems we started building two years ago." Weber came aboard in mid-2011 and implemented a three-year plan for development, which at the time sounded like so many other plans before it for Madden, all of which sought to give the product some coherent vision beyond being a year-to-year introduction of features with easy-to-market themes. But in 2012 the plan delivered real-time physics, something desperately missing from this full-contact sport, plus a unified career suite that has no imitator coming into its second year. "We are going to hit this transition with all of the game modes and all of the depth you have in generation 3 [the 360 and PS3]. You will absolutely have all of the depth of those games, and much more." "All our teams—Madden, FIFA, UFC and the NBA team, because we're all working off the same code base today, the advances Madden make benefit the FIFA team, which benefit the other teams," Bilbey said. "We're working closer together than we have in our history." In the last console transition, EA Sports had half a dozen titles going it alone into the new era, and nearly every one of them stumbled. In this transition, EA Sports has decided it will win or lose as a team.